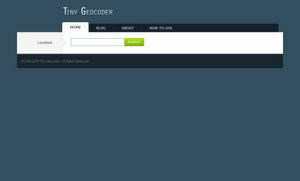 TinyGeocoder is a nifty service that translates an address to latitude and longitude coordinates, better known as Geo-coding. The service is very simple to use, just enter a location, be it a country, city, street or even a popular location such as Times Square, and you will instantly get the lat/long coordinates, a Google map showing the location, and a URL that you can easily share. TinyGeocoder offers a simple and straight forward API that you can use in your own map mashups, and it works both ways; meaning, you can either use it to get the latitude/longitude pair, or you can use it as "Reverse Geo-coding" to get a location from the lat/long coordinates. Nate Ritter, the creator, just "overhauled" TinyGeocoder, only on the surface though, as what is packed in the engine is great enough not to touch.